PHNDC's effort to designate parts of Prospect Heights as a historic district. 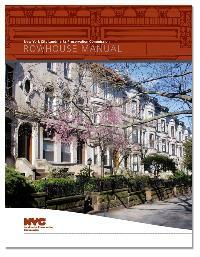 The New York City Landmarks Preservation Commission has launched a new manual on its website to help property owners in City historic districts (such as the Prospect Heights Historic District) file complete applications that include the correct materials, enabling our staff to review work proposals more expeditiously and issue permits with fewer delays. The LPC Permit Application Guide lists the materials that must be submitted, describes the criteria a project must meet to qualify for a permit, and explains the preservation principles for those criteria. In July, the Department of Transportation installed new street signs throughout the Prospect Heights Historic District. Forty-nine existing signs within the district were replaced. The new street signs will more clearly indicate the boundaries of the Historic District to residents and visitors. Historic markers, each with a map and description of the district, will be installed later this year. On Wednesday, March 23, PHNDC will host a forum on property ownership in the Prospect Heights Historic District with members of the NYC Landmarks Preservation Commission. The session will begin promptly at 7:00PM. Speakers will explain the process for applying for permits for changes to buildings in the district. The NYC Landmarks Preservation Commission has updated and revamped its Rowhouse Manual, a handbook that assists owners of the buildings that lie within New York City’s 116 historic districts and extensions maintain their special properties. It also offers step-by-step instructions on how to work successfully and efficiently with the Commission throughout the permit process. Owners of properties within the Prospect Heights Historic District are encouraged to download and review the updated Rowhouse Manual prior to planning remodeling or maintenance work on their buildings.